Western Digital has launched a new external storage device that offers hassle-free backup while providing remote access to all your data. The My Book Live Duo comes in two dual-drive configurations (2x2TB for $400 or 2x3TB for $500) and maintains a real-time backup copy of your data. PC users can use the included WD SmartWare software for automatic backups, while Mac users can use Apple Time Machine. By default, the drives run in RAID 1 for additional redundancy, so if one fails the other will come to your rescue. However, you can combine the capacity of both drives into one massive volume if you need the extra capacity. Unlike many external backup drives that connect via USB, the My Book Live Duo is more like a budget NAS. Data is handled swiftly courtesy of an integrated 800MHz processor and Gigabit Ethernet. Along with pumping your bytes over a local network, the device serves as a "personal cloud storage system," providing remote access to all your files. Once your data is on the Live Duo, you'll be able to access it from any device with a Web browser via WD2go.com. There are also dedicated apps for Android and iOS devices. Additionally, the Live Duo's built-in media server streams pictures, music and movies to any DLNA-certified device, such as a Blu-ray player, game console, set-top box, mobile device or smart TV. 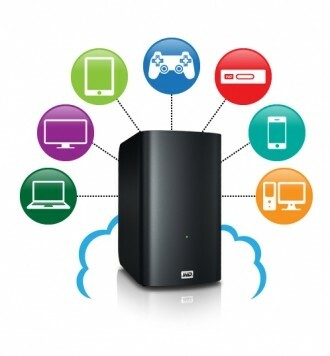 "My Book Live Duo is really the ideal, all-in-one storage and entertainment solution for today's ultra-connected consumer," said Chris Bull, director of marketing for Western Digital's Connected Home Solutions group. "The ability for consumers to safely backup all their digital content, as well as access and share content from anywhere in the world on their tablet, smartphone or any computer, truly provides a unique and rewarding experience for anyone who wants to enjoy, and needs to protect, valuable digital content."